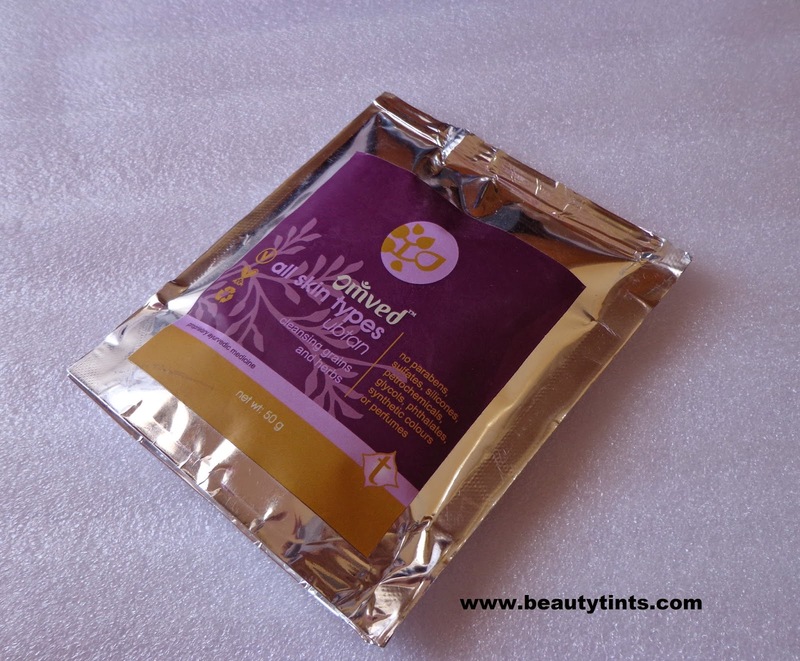 Sriz Beauty Blog: Omved Ubtan for All Skin Types Review! Today I am reviewing Omved Ubtan for All Skin Types which contains cleansing grains and herbs.It is free from parabens,sulfates,silicones,petrochemicals,glycols,phthalates,synthetic colors or perfumes. What the Brand Says :"Omved is a world of beautiful products, well researched, designed and hand-crafted for your well-being and lasting satisfaction. Our endeavour is to offer and impart healing qualities through our 100% natural well-being products to bring you back in balance. 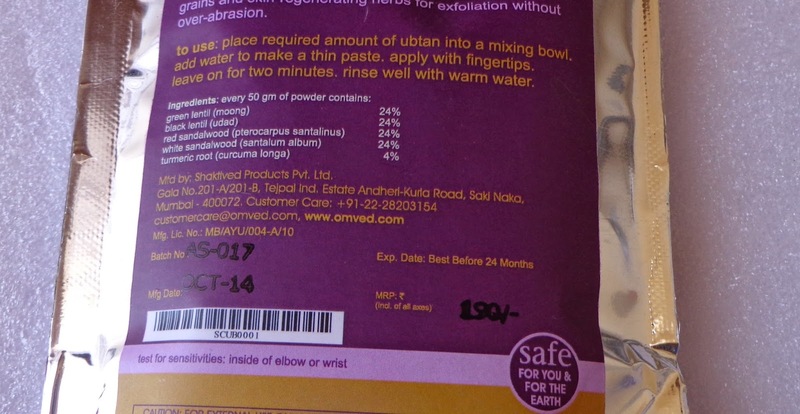 Omved ensures that each and every item used in the products is chemical free, natural, hand-crafted, fair trade, made in India and biodegradable.All products at Omved are authentic and ethical – embracing design and sustainability, beautifully finished and reviving our ancient Vedic traditions.They are safe for you and safe for the earth." For More details about Omved...You Can Check out their face book page as well as their a Website. 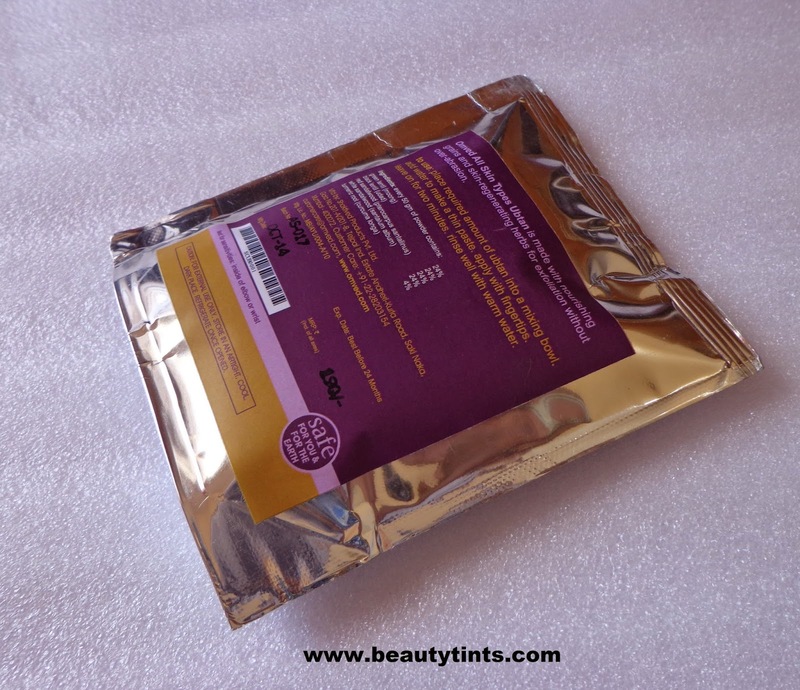 Packaging :It comes in a foil packaging with purple colored labels on either side. Directions for Usage : Use as your regular body and facial cleanser. Place required amount of ubtan into a bowl. 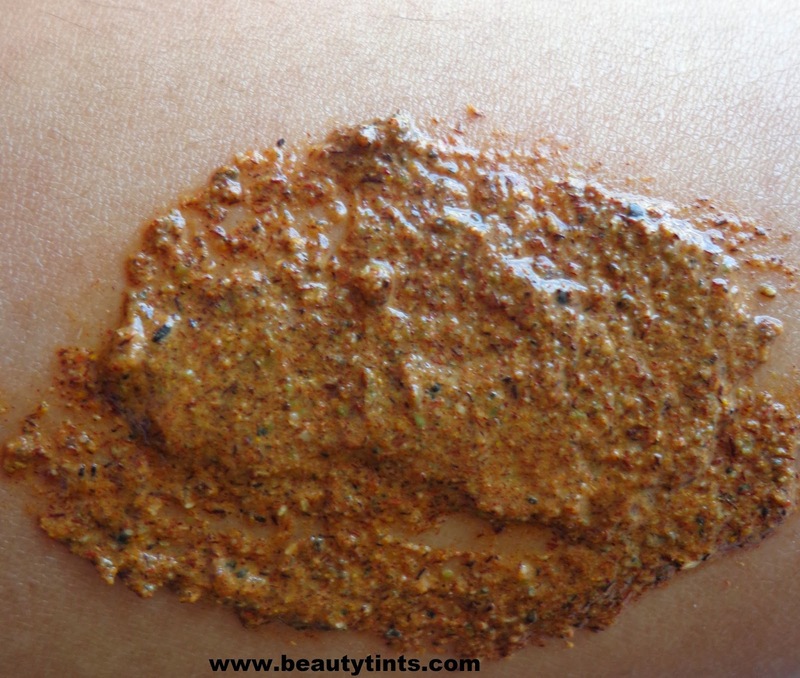 Add water, Rose Water or Aloe Vera Gel to make a thin paste. Gently massage in circular motions. After a few minutes, rinse well with room temperature water. As a pack - apply about one-quarter inch thick and leave on the skin for about thirty minutes. Then remove the paste in a cool water rinse, to which you might add a little lemon juice or rose water. This Ubtan is meant for both body and face for removing facial hair as well as to make the skin soft and supple.It is a natural skin softener which is made up of protein rich flours, aromatic healing powders, therapeutic spices and a host of other herbal ingredients. 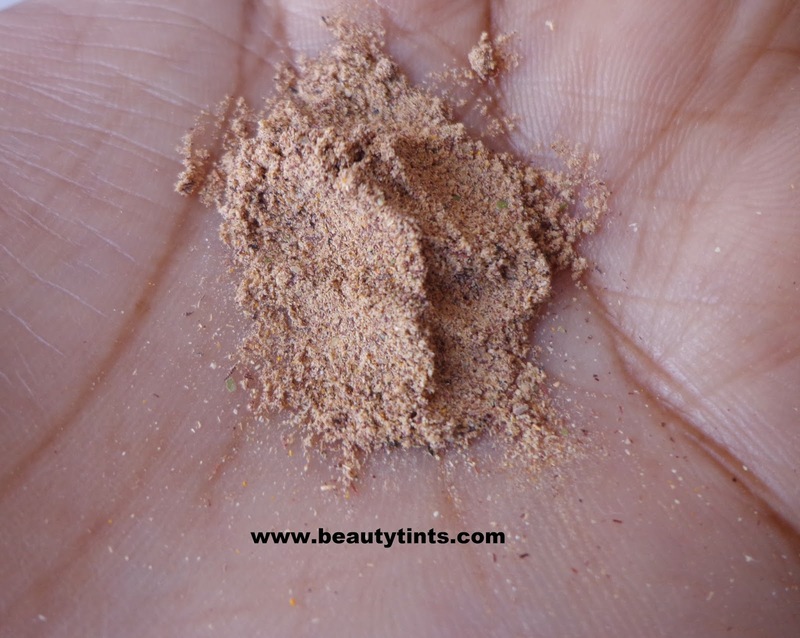 I have not used it on the face as currently I am suffering from acne,I do not want to experiment on it.I have used it on my body by mixing it milk,it can also be mixed with water or rose water,but I prefer to use it with milk.This is a finely grounded powder with very fine granules,which are not very rough or coarse on the skin.I massaged the paste on to the body and left it for 30 minutes and then rinsed.It immediately made my skin super soft and supple.It cleansed the skin very well and did not dry out,but I am not sure whether it dries out if used with water,but with milk it did not.After 10 mins of application,it tingles a bit but after rinsing,there is no tingling or irritation.It makes skin clean,clear and radiant.A must try for brides-to-be.I will only suggest this for body,as I am not sure about its effect on the facial skin.But those with sensitive skin can skip this.This body scrub is enriched with the goodness of green & black lentil,red&white sandalwood and turmeric. 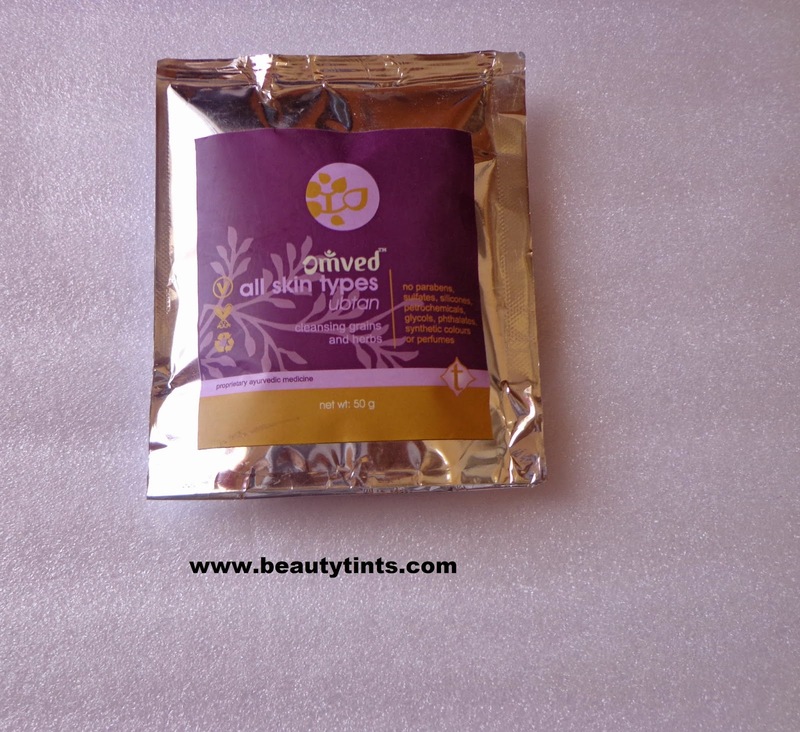 Final Conclusion about Omved Ubtan for All Skin Types: Those who have normal skin and love to pamper their skin naturally can gives this a try, especially before special occasions! Have you participated in the Giveaway? If not participate here.